Welcome to The Ultimate Cups to Grams Conversion Sheet! Have you ever seen a recipe in cups and tbsp and wondered how it translates to grams? Gotten annoyed at a recipe that’s all in grams because all you have at home at cups? Below is a direct link to a very handy sheet I invite you to print – and love. We lovingly made it just for you! It includes almost all ingredients regularly used on this website and many others like it. Go ahead and print the sheet out, stick it on your fridge or inside one of your cupboards and POW! 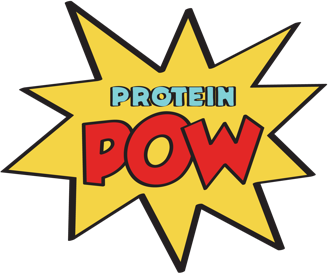 You’ll have a useful guide to convert all Protein Pow recipes – and beyond – from cups to grams (and vice versa). It seems blatantly obvious but seeing it like this, it makes you realize that you really only need ONE measuring utensil to get EVERY SINGLE cup conversion. So if a recipe calls for ¼ cup of something, you don’t NEED to own a ‘1/4 cup measuring cup’ because 1/4 cup is just 4 measuring tablespoons (because remember, 2 x tablespoons = 1/8 cup and 2 x 1/8 cups = 1/4 cup). If tablespoons bug you, you can just buy a 1/8 measuring cup. With it, you can get ¼ cups, ½ cups, and 1 cups! Moral of the paragraph: you DO NOT need to fill your kitchen up with all kinds of volume-measuring equipment if you don’t want to (if you do though, get some like these – they’re the ones I use). Let’s now turn to the list itself which features some of the most popular ingredients used here at proteinpow.com. Please feel free to print this out and stick it in your fridge if you want. The list will allow you to convert any and all recipes found in this website without requiring you to buy a measuring scale or a bunch of measuring cups/spoons. Win win, right? Please let me know if you need any other ingredients converted by leaving a comment below. Well then gladly measure your ingredient and turn it into either cups or grams. The point here is to make cooking easy, hassle-free and fun for you, so please do get in touch if you have any questions. This guide will appear in the new version of the Protein Pow App! It’ll show up as an update in the iOS store within the next couple of weeks. Exciting times.